…an odd piece of advice, to be sure. Why would you need permission to write? Because you won’t succeed unless you do. At its very core, writing is a solitary function. Not so much once you’ve completed a novel; at that point you will be sharing your work with beta readers, editors, proofreaders, agents, and hopefully a publisher. It won’t be so solitary at that point. The project itself, however, is a relationship between only you and your keyboard or, for some, a notepad. The permission you need to give yourself is to take that time away from friends and family. It means saying okay to feeling guilty about doing something for yourself, and not to be so vigilant about doing laundry or vacuuming or getting the car washed. Be a little selfish about understanding that anyone can get the chores done because only you can do your writing. I’ll repeat that: only you can do your writing. The expression of art comes from within; it is unique to the individual. 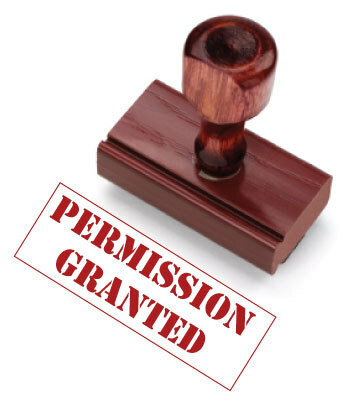 Often, it requires taking that permission one-step farther, and it’s one of the hardest. You must learn to say no: no to invitations, no to watching an extra episode of a TV show, and no to friends and family on occasion because you must be faithful to the process of getting words down on paper. I have also encountered another form of permission I needed to give myself. Story ideas circle like mad in our minds. While they’re tucked away up there, they remain safe. You remain safe from people thinking you’re a little bit touched in the head (face it – we are). Writers become fearful about bleeding their stories onto the page, as it becomes the evidence of our madness. Give yourself permission to write them anyway. I had a dream when I was about ten years old. Two of the characters in my dream were girls from school, but in my imagination they had morphed into leprechaun-like creatures, hell, they were even dressed in green. They virtually kidnapped me and brought me into their world. I still wish I could remember what went on during that part of the dream, but I distinctly recall them bringing me back at dawn and leaving me in the sunlit hallway of my house. I was frantic they were going to go away, because I wanted to go back. I woke up angry about losing my grip on the dream. I tried desperately to go back to sleep, but it was no use. That dream has haunted me most of my life. While it didn’t provide a distinct story idea, it did give me a sense of wonderment of the paranormal. Forty-odd years later, I did have a story idea, one that involved fairies and elves, but I felt ridiculous wanting to write it. Many people either love or hate the Twilight series, but I owe particular thanks to Stephenie Meyer. While reading her series, I recognized it was okay to put paranormal-esqe ideas into a novel. I’ve not felt funny about writing or sharing any subject since, because I gave myself permission to allow my imagination to produce a completely new world. There are a gazillion forces and reasons, which prevent writers from writing. Be true to your inner passion and give yourself the permission to do whatever it takes to answer that call. Not every writer is destined to have a book or a short story published, but that has nothing to do with what’s inside. If you truly have the passion, if you actually feel resentful or annoyed when you’re prevented from getting those words out of your head, then write a permission slip to yourself and get to it. It’s the empowerment you need. Loved the post! You are absoutely correct. Why should we feel, we need permission to write. This post has helped me become more confident.